Easy button! So we’re moving in the next couple of weeks, and it was kind of a last minute move, unexpected, yet ended up being the best thing possible for us right now. Our landlords are selling the house we’ve been in for many years, so it’s bitter sweet. We love our neighbors, they bring us oysters, we love our neighborhood, it’s sweet, quiet, and full of trees. This house has been a blessing. We moved from Sacramento, Ca to this house four years ago after quitting our jobs, and going back to school. As you know, I went to Culinary School, the best decision of my career thus far. In the frenzy of finding a house, getting approved, moving trucks, cable, and working on top of boxes, and packing, I sit down to write this to reflect. This is when it has settled in that I appreciate this house, and all it has meant to us over the last several years. Reflecting is a big part of change. Although this may have been a forced change, it is welcomed with open arms. It is time to move on, but first I look back at the events, ups and owns of uprooting our lives in Sacramento, and having this pretty house to call home. Many BBQ’S, Holidays, guests, thousands of meals made in the kitchen for us and the blog. Again, bitter sweet. I am grateful the landlord took us in because she had a good feeling about us, for that I am so grateful. She rented us the house from two states away to two self employed adults, going back to school. Risky, and it of course we knew it would be ok, but she had to trust me over the phone assuring her it would be ok. Many other rental flat out said no. Little did they know, we are the best tenants a landlord could have :). We make our houses homes. Now we move onto our next chapter. While we had intentions of buying a house sooner than later, that is now on hold for our next adventure, and it’s all good. We must go with the flow, and things always work out for the best for us. Our new home is beautiful. It is also in a pretty neighborhood, giant luscious tree lined quiet streets. I have a huge new kitchen with a plethora of counter space, and bright white light for amazing pictures. I am looking forward to settling in to work in that space. There is a huge front and back yard for us and the kitty girls to enjoy, and tons of room to stretch our legs. There are two fireplaces! TWO! Suffice it to say, it is a lovely home that will be a part of our next chapter, and we are very much looking forward to it. So this is why easy button. Packing kitchens, blog prop rooms, and trying to cook elaborate meals is a for sure no for me. I easy button. 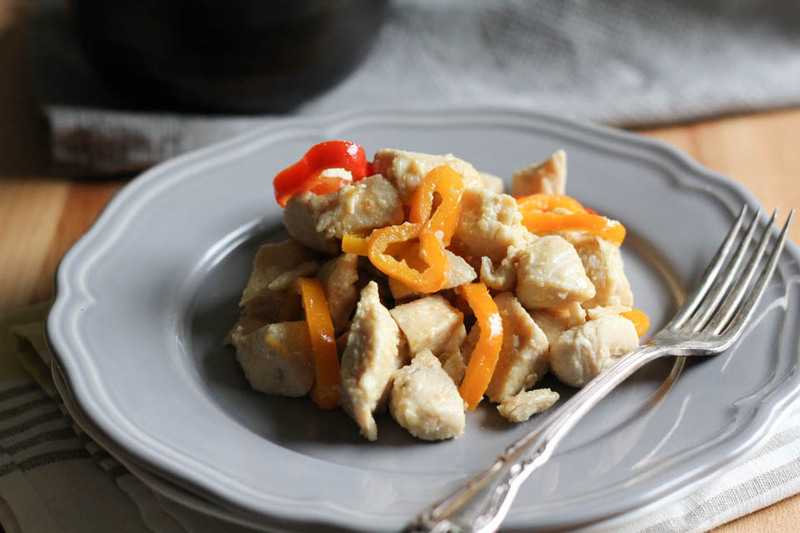 Stir Fry Garlic Chicken with Sweet Peppers is such a good easy meal to make among the boxes, phone calls, lists, packing, and keeping things a bit sane around here. We all know moving, it’s easy, but a bit messy. This dish keeps us eating healthy, great for leftovers, and everyone helping us pack move loved it. Thanks to Gourmet Garden I have good food to fill our tummies, so that is cool too! 1. Place olive oil in a large pan or wok over high heat. Once oil is shimmering, add chicken pieces, sprinkle with salt, and cook for 10 minutes, stirring frequently. Add soy sauce, mirin, and peppers, cook for 3 minutes. Lower heat to medium low, add garlic, cook for 5 minutes, stirring frequently. Serve immediately. Store leftovers in an airtight container for up to 3 days. Other tasty recipes I’ve made using Gourmet Garden! Gourmet Garden recipes from my blogging friends! It is great that you are so positive about your sudden move. It definitely is not the most pleasant thing but for sure it’s great to start looking for a place of your own. Good luck with the move and thanks for the recipe! Greets! Thank you, Yvonne! I really appreciate it, it has been a lovely home and worked out great. I hope you like the chicken! Congrats for the move! It is great when moving to a new place and start another chapter of your life… The recipe is great, as usual! Thanks for sharing and good luck with settling! Thank you so very much, Deborah! I appreciate it :). It is very convenient for that quick dinner/recipe. I too mince a lot! Oh thank you so much! We finished moving Monday, and I love love this house. The kitchen light is so good! I love your attitude about your new place even though it wasn’t your decision to move. I moved last summer and know how hard it is to get dinner ready when you’re busy doing a million other things. I love Gourmet Garden because they help cut down on prep time. It sounds as though you have built a treasure trove of memories in that house and I’m sure it will be tough to leave! 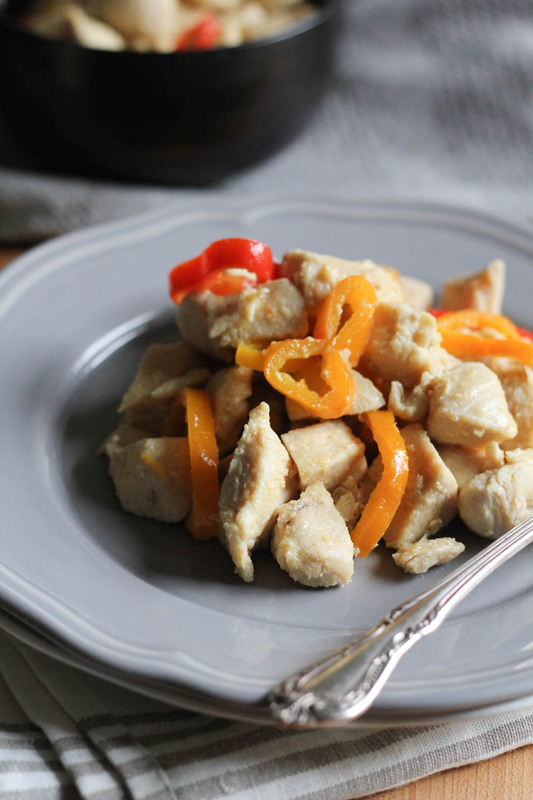 This chicken is the perfect thing for a busy weeknight meal! We definitely have. It’s time to move on, and it has been such a blessing! Thank you, I’ll be making it again tonight :). Congrats on the new place! This dinner is right up my alley! Two fireplaces! I am super jealous of your amazing-sounding new house. 🙂 Hope the move goes well and you get to eat lots of tasty things like this while cleaning out your fridge! Thank you so much dear! Me too, it’s getting scarce in there, so it’s getting closer and closer to sandwiches all day long lol! I love this dinner, it is one our favorites on busy days too. Congrats on the new chapter, sounds like you’ve found the perfect place to call home! 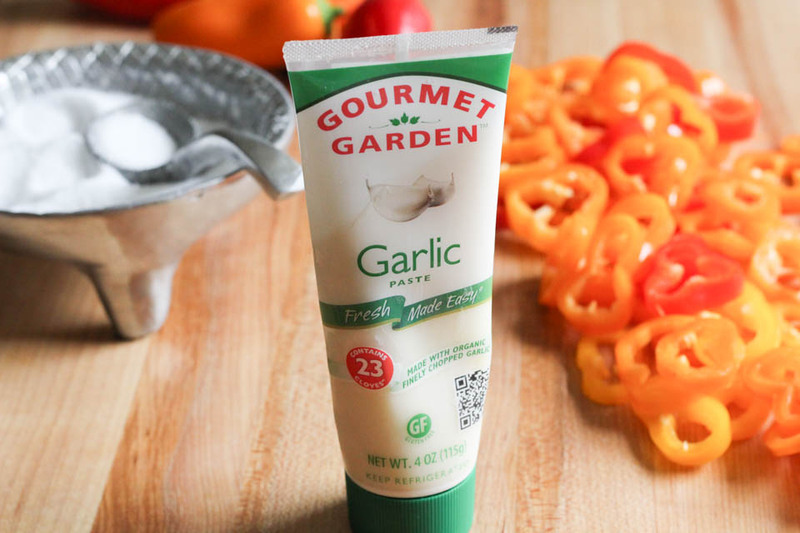 I love Gourmet Garden products and use them all the time – love that I don’t have to run to the store for fresh and still get fresh flavor! I appreciate you including my recipe in your post – HUGS!!! You are the best! Oh me too, they make dinner so much easier on so many levels. Thank you, I am looking forward to the new counters, a baking station, and good vibes! Love your news about your new digs! I know it will be the start of a wonderful new adventure. Congrats on EVERYTHING you have accomplished. 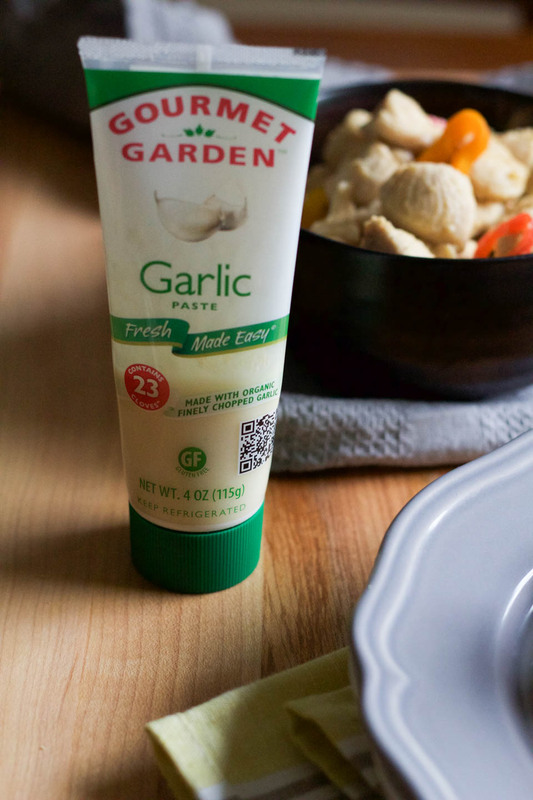 And yep, that Gourmet Garden garlic is one of my favorite shortcuts! Thanks for including my Epic Garlic Bread in your post. Very sweet of you. I always love your perfect kind words, thank you :). I am so excited! Gourmet Garden really makes things easier during these times. Of course, your bread looks awesome! I love garlic bread, it makes the whole house smell so good. Congrats on your new home! Definitely jealous of your counter space. Love this simple but perfectly flavorful recipe. Pinned!